Administrators and recurring customers can now access and submit information through our optimized smart phone browse user interface. Easy to manage user interface allows your administrators quick access to View Events, Add Events, View Contacts, Add Contacts, View Tasks and Add Tasks. Viewing Events allows you to Search for upcoming events, view past events, edit events or view PDFs. 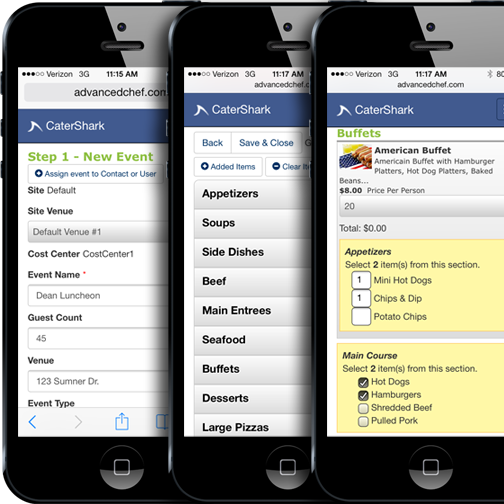 CaterShark mobile admin allows you to easily scroll through all your events with the flick your thumb. Need to add a quick task or reminder. Log into your mobile admin on your smart phone device and quickly add a new tasks or view your existing tasks. Looking up one of your catering contacts has never been easier on CaterShark. Our mobile enhanced People section allows your to quickly view or edit existing contacts or vendors. The CaterShark Admin Mobile Dashboard allows administrators to view quick snapshots of your upcoming events, past events, event income daily and event income weekly in chart format.